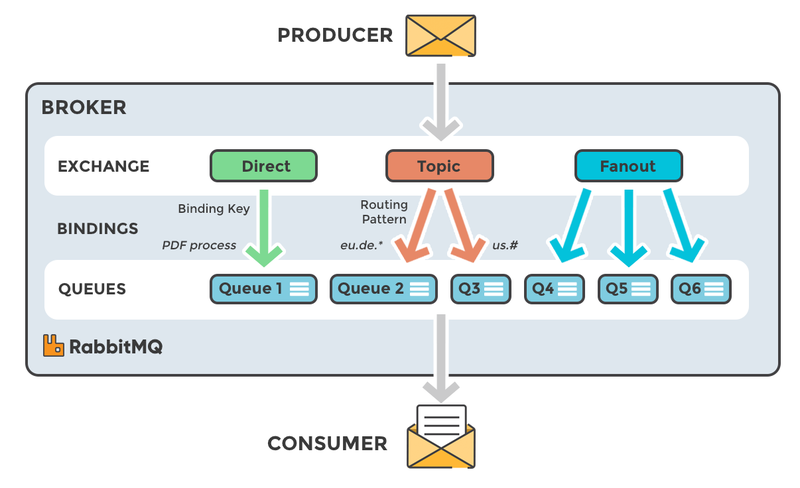 RabbitMQ is one part of Message Broker that implemented Advance Message Queue Protocol (AMQP), that help your application to communicate each other, when you extends your application scale. Before I talk about RabbitMQ, I want to make sure that all of you know about 2 ways to communicate between micro-services. They are Point to Point (P2P)/Synchronous Communication, and Publish-Subscribe (Pub-Sub)/Asynchronous Communication. What is the differences between those two? P2P as it’s called Synchronous Communication, we know that one app will directly communicate to other app, using HTTP protocol, which is the app does require immediate get response directly from the server. Pub-Sub as it’s called asynchronous communication, we know that it’s does not required immediate response from the server, and the message that sent will be placed to a message queue (or known as Event Queue in Enterprise Messaging System). Why do we need to use RabbitMQ? Decouple: What means by decoupling is separate the core components of the application. This is what any application that implement micro-services wanted. Because their application will be maintainable and improve it’s quality of Single Responsibility Principle. Flexibility: Because the application has been decoupled, so the application will be flexible enough for being develop to the next phase. But no only that flexible, because if you are using RabbitMQ, you will be able to connect 2 different apps/service that written by different app, these application will talk to each other by the help of a “translator” which is MOM. Trying to learn what is producer, consumer, message, exchange algorithm, differences between RabbitMQ and Kafka. Thanks to Marthin Pasaribu, Rizki Maulana and Andi Pangeran for the information.